Reading this very competently put together, adult, adventure thriller very much reminded me of the Wilber Smith books I once devoured. The continents that provided location may be different, but the landscapes are not so dissimilar. Snyder has a similarly smooth ability to write believable gritty plot. This story is full of rich vistas, both large and small, which are filled with dramas from characters clinging onto both sides of the good and evil divide. For those that appreciate reading raw brutality, there is no shortage. 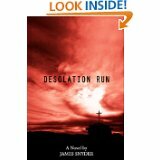 There is enough perverted cruelty, lust, greed, pain, and death to fill any action packed thriller. There is also just about enough hope, even when all those that have any good in them are being bashed senseless by the one main character that it is impossible to have any sympathy for. This isn’t a comfy read. If it was a film it would be adult rated with warnings. However, it is great entertainment that actually manages to avoid getting over voyeuristic even in the most violent action. Accepting, of course, that the writer only guides the thoughts conjured in our own heads. The book is well written, using obscenity and crudity for effect and not as punctuation. The main characters are full and interesting, working in a plotline that reflects realities that are for most of us just extremes of life that we will never have to face ourselves. Description is detailed without being laboured and the very few grammatical strains didn’t cause enough of a trip to require my rereading of any sentence. We are asked to follow at least two, and sometimes more, characters points of view, but only once was I confused by a change of POV. Some of the secondary characters are a bit clichéd. That though is perhaps inevitable given the breadth of the plotline contained within the word count of the book. James Snyder is a great story teller. Look out for his works.